Vintage porcelain demitasse set marked Betson's Japan Hand Painted. 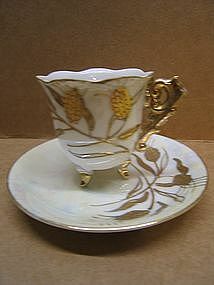 The cup is 2 1/4 inches in height and the saucer is 4 5/8 inches in width. The finish is opalescent. Neither piece has any chips, cracks, breaks or rough rim, but has light wear to the gold. I need your zip code to calculate the postage.